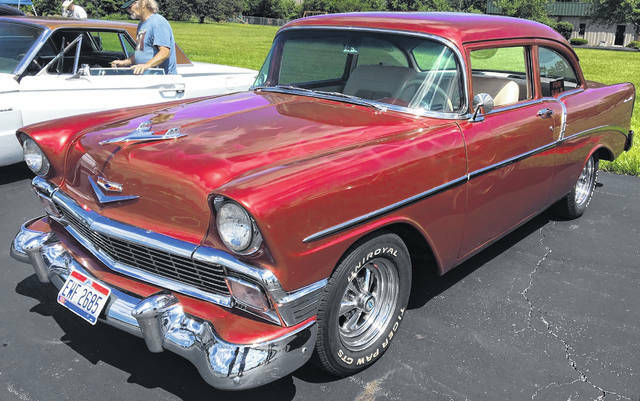 Bob Montgomery, of Lima, enjoys the people as much as driving his 1956 Chevy. LIMA — Bob Montgomery, of Lima, brought his 1956 Chevy Coupe to the Lima Chevrolet Cadillac Charity Car Show in June. He has owned this beauty for eight years. Chevy once again beat Ford in sales this year, but not by much. Montgomery finds he enjoys the car shows due to the people. https://www.limaohio.com/wp-content/uploads/sites/54/2018/11/web1_56-Chevy.jpgBob Montgomery, of Lima, enjoys the people as much as driving his 1956 Chevy.